Mike’s story of immigration to Manhattan is fascinating (and an example of why I so love to walk and meet the people on the side streets). Growing up in Beirut, Lebanon, he originally wanted to be a jewelry designer, but did not have enough money for materials. Instead, he turned to hairstyling. He swept the floors in a Beirut hair salon for the equivalent of $3 per week and miraculously managed to save enough money to pay half the tuition to go to beauty school. The school wanted to refuse him admittance because of his lack of funds, but Mike persuaded them to let him work as a janitor at night in order to pay off the rest. He graduated and started making a name for himself as a hair stylist, catching the attention of Lebanese celebrities. He moved to New York in 2004, but is still sought out by old Lebanese clients traveling in the area. Mike worked on the Upper West Side for ten years before realizing his dream. Today, he has some college age clients who have been coming to him since they were children. I, too, have become an immediate fan. I walked out of the salon after my first visit knowing that I would not be going anywhere else again. In addition to brightening up my color and giving me an outstanding haircut, I was totally taken by the ease with which Mike and his team work and the speed that he gets his clients in and out without making them feel rushed. I loved the intimacy of Salon Riz best of all. Katherine is the manager of the salon and her loyalty to Mike was apparent from our first conversation. She met him while they were both working at Extreme Color and then followed him when he opened on the West Side. In speaking about the decor, she commented, “Even the tiniest detail Mike picked out.” She pointed to a picture frame, showing that the angle at which it hung, forming an asymmetrical diamond, was specifically chosen by Mike. He is constantly adding to his cozy home and changing it for the seasons. “Every time I come, something is different or added,” Katherine said. When I visited, it was late January, and some small flowers had already been hung from the lights in anticipation of Valentine’s Day. Katherine shared that on February 14th, everyone who walks into the salon leaves with a rose. Katherine went on to say that in the springtime, Mike hangs butterflies on the ceiling, giving clients something pretty to look up at while getting their hair washed. Mike told me that the space used to be the rubbish room for the building. He picked up the little sign (“RUBBISH”) that he had saved and decorated as a remembrance. The renovation understandably took a long time, and when he opened in June of 2014, he had only just finished construction. He is now very pleased with the place he has carved out for himself a year and a half later, calling it “rustic chic.” “This is a space for the community,” he told me. He hosts various events in his salon, including a comedy show featuring Danny Cohen of Comedy Central along with five other comics and a holiday bazaar through the month of December. Mike either shares the space for special events, as was the case when shop owners took over the treats table during the winter holidays, or he completely reconfigures the interior for shows, using salon chairs as additional seating. Sometimes the events are directly tied to enhancing the experience of his customers, such as when he brought live music into the salon during New Year’s Eve to entertain the clients having their hair done. Katherine shared some of the other unique concepts that Mike has instituted to enhance everyone’s experience. For his frequent customers, he has special alerts next to their name in the computer system, such as, “This customer likes Tina Turner and white wine.” Because of the personal attention and the warm relationship that Mike has developed with customers, they often wander in just to say “hi” and to grab a cup of coffee. 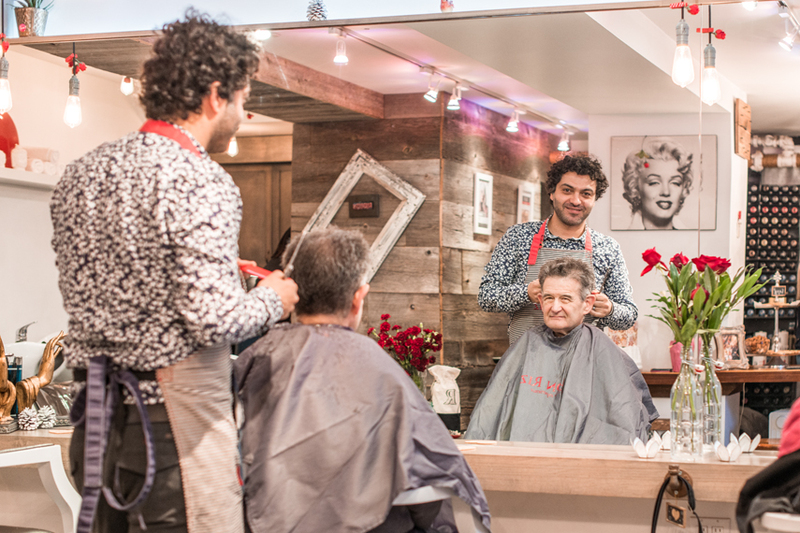 “I always encourage people to come in and say hello, even if they’re not getting their haircut,” Mike said. Though he gets a lot of people who live and work in the neighborhood, he is also sought out by many men and women throughout the city. On the day that we stopped in to take some photos, Olivia, a member of the Manhattan Sideways team, shyly asked if Mike might have a second to trim her bangs. She was so pleased to be attended to by this gifted artist and loved the way that he styled her beautiful long head of red hair. She paid particular attention to the product that he used – Mike told us that Label M, designed by hair stylists, was a London Fashion Show sponsor. He went on to say that he always tries to stay on top of the newest and best hair products. Cost is not an issue; quality is what matters to him. I believe that Mike has gained not only me as a new customer, but Olivia as well. Upon leaving Salon Riz, Olivia declared that the journey from Brooklyn will certainly be worth the trek.